And today is another Feminist Fashion Bloggers event! This time, finance, and once again I find that I already said many of the things I wanted to say on this issue. So here's another links roundup, with a bonus thought: financial independence is important. 1. Why boycotting Target misses the mark -- unfair labor practices and consumerism. 2. Lanvin for H&M -- more on labor practices, and the link between fast fashion and increased consumerism. 3. Ethical and affordable wardrobe -- you don't have to sell your soul to dress nicely. Well, maybe just a little. 4. And finally, Schmatta -- the relationship between fashion, labor unions, and fair labor practices. I blogged about Izumi Hongo last year, and gushed quite a bit. It is unusual to find such subdued yet unique esthetic, and I'm greatly pleased that these features not only persisted but developed in the new collection, Salonniere. Last year, I talked about the overall sense of 'delicate', of the way her fabrics work with the body and how she does interesting things with textures. Here we see that the Dutch art inspiration still persists, in the form of a stylized bonnet. 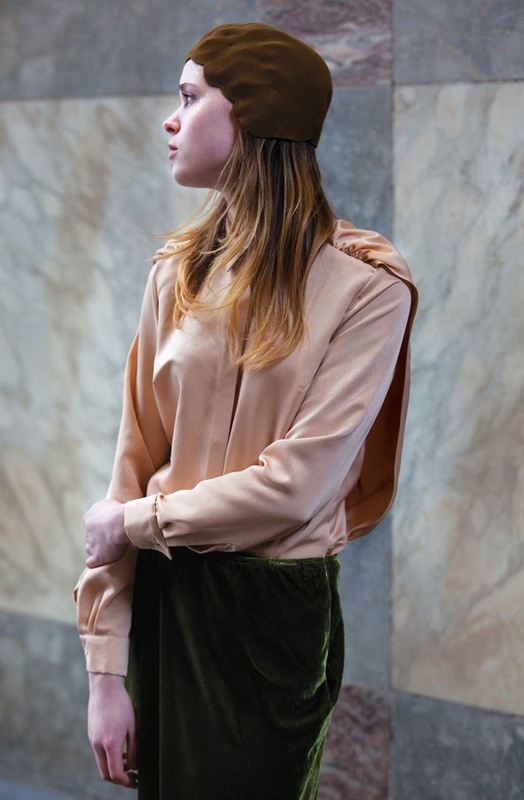 It is combined with a sleek silk blouse and velvet-looking pant in a thoroughly current coupling of unusual color combination and subtle play with texture. Last year's woolly boucle is only hinted at in this textural contrast. More velvet; I usually dislike it because it tends to get stuffy and overly formal, and skews into cheap or costumey way too easily; here however a rich yet subdued golden mustard color and fluid drape, plus the uneven hem and what looks like quite an unusual sleeve make velvet interesting and anything but stuffy. It suggests tactile richness, and the draped but sleek skirt and low-contrast, classic shoe create the silhouette I would describe as ladylike if it wasn't so modern. Heart of Iron, my next book, is an alternative history. History in question is Russian and Chinese, and it was suggested to me that it might be a good idea to talk about some of the events that happen in the book, and how they relate to actual history. I will also link to these blog posts from Heart of Iron's novel page, for easy reference. I'm linking to English-language sources, mostly Wikipedia, since most of my research was done in Russian and thus the sources are a lot less accessible. There are also some pictures of historical parks and museums in Moscow, because why not? First up: The Decembrists. Even though the book starts in 1852, the central conceit is that the Decembrists' revolt was successful, and Constantine never abdicated the throne. He became the Tsar-Emperor, serfs were freed in 1826 rather than 1861, and Russia became fairly industrialized by 1850's because hey, surplus labor to build railroads. But I'm getting ahead of myself. The Decembrists are as iconic as any historical figure may get. 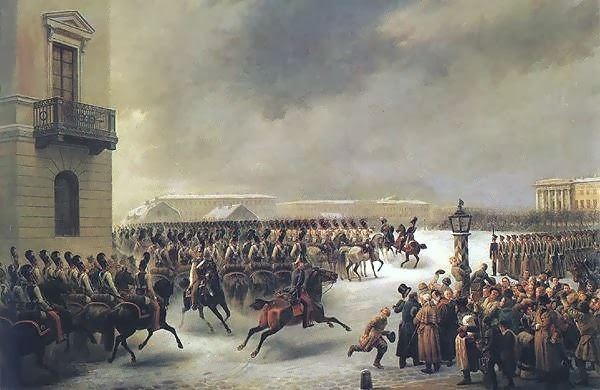 The painting above depicts their stand on the Senate Square of St. Petersburg. The rebellion was led by several officers, most of who were veterans of Napoleonic war of 1812. The Decembrists were members of two secret societies: The Southern Society (led by the fairly radical Colonel Pestel) and the moderate Northern Society, led by officer Muraviev, and Princes Obolensky and Trubetskoy. The Southern society was invested in abolition of serfdom, and in getting rid of monarchy altogether and installing a republic, plus redistribution of land (half to the state, half to the peasants.) Northern society wanted a British-style constitutional monarchy, with abolition of serfdom; they were also the ones who organized the rebellion. Much has been written about the Masonic roots of these societies. What seemed more relevant, however, is that these military men, instead of upholding the order they were meant to protect, became disillusioned with it -- many as the result of Napoleonic Wars, when they had witnessed the cruel treatment soldiers (peasants) were subjected to. Many of the future Decembrists were initially heartened by Tsar Alexander's tendency toward reformism, but he quickly retreated into repressions -- a sad tendency of Russian tsars when faced with any difficulty. After his death in November 1825, The Decembrists swore loyalty to Alexander's brother Constantine, then governor of Poland, who was supposed to inherit his throne. Constantine, however, abdicated, and Nicholas took the throne. The Northern Society called on its members to not swear loyalty to Nicholas (the youngest of the three brothers), and the Decembrists revolt was the culmination of this decision. They were not very fond of Nicholas, and Constantine, known for his tendency to stand against the wishes of his family, seemed like a better candidate for a reformed government. They took their stand on The Senate Square. Needless to say, the revolt was suppressed and many of the leaders were executed (Pestel, and three others) and the rest were exiled to Siberia, Kazakhstan, and Far East.